Arriving from the South: Depart on the M90 at Perth after crossing the Friarton Bridge, signposted the A93 to Blairgowrie. Stay on the A93 from Perth until Blairgowrie. From here follow signs for Alyth. Turn left past the Blackbird Inn signposted to Alyth (B952). There is a Market Square in Alyth. From the North: Depart on the A90 at Forfar, signposted the A926. Stay on this road through Kirriemuir and follow signs to Alyth (10 miles). At the roundabout, take the third exit onto Meigle Road signposted Alyth B952. Bear right onto Airlie Street then turn right onto Market Square. The picturesque town of Alyth in historic Perthshire is to the south, Perth is but 25 minutes away, to the north lies The Spittal of Glenshee where you will find Scotland's largest skiing area, to the west, lochs and glens await, including the highest peak in Perthshire, Ben Lawers at some 1214 metres. 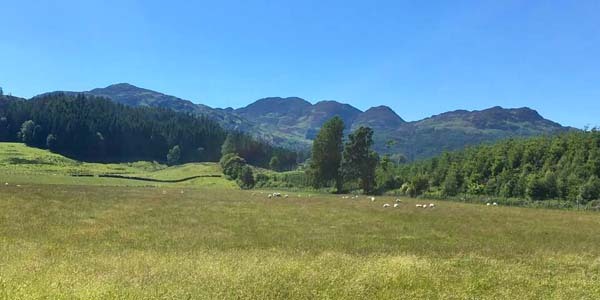 Perthshire is a varied county of great beauty, with mystical highland moors and lowland soft berry fields, distilleries, historic castles, dramatic waterfalls, and is of course a golfer's paradise with a wonderful choice of golf courses within an hour's drive. Walk some stunningly beautiful trails, be it a gentle forest walk through ancient woodlands or hiking up a Munro. There are also many cycle trails both on and off road, or enjoy some fishing - the choice is yours! Nearby historic buildings include Glamis Castle, Blair Castle and Scone Palace where ancient Kings of Scotland were crowned. The Queich or Alyth Burn runs through the middle of the town with several bridges passing over, the oldest of which is the packhorse bridge dating back to the 16th century. Linked with Arthurian legend, on nearby Barry Hill lies the ruin of a fort in which it is said that Mordred held Queen Guinevere captive. Several self-catering cottages have been fully renovated to an extremely high standard, and designed to cater for your every whim. Feel indulgently comfortable so that, you may not want to leave! A warm welcome awaits you in Alyth, stay for a few days or longer and you will leave relaxed and rejuvenated, and probably will have made a few new friends.